>> How to Build a Small & Simple Waterfall With Stone? When you intend to construct an outdoor waterfall, you have to focus on two main features. And, the two features are: (1) the pool where the water will fall into,and (2) the cascading feature for the waterfall. Herein, building a waterfall can be quite a challenge. This article shows you a simple way to build one using rocks that may be present in your compound. Waterfalls have different shapes and sizes. When thinking about what design to choose, you should concentrate mainly on how to create the needed height for the outdoor waterfall. Usually, a landscape designer will exploit the slopeof the land. Otherwise, if the land is level, he/she constructs a beam (a man-made slope) to forma waterfall at the back of the pond. Either way, this translates to a lot of expensive work. When constructing a relatively huge outdoor waterfall, you should put a flexible liner on the surface between the pond and the water, to transport the water. Boulders are afterwards put on the liner to hold it in place and cover it. Unless you intend on having a large outdoor waterfall, such work and costs are not needed. Normally, a lot of homeowners who have smaller spaces for landscaping prefer a smaller-sized outdoor waterfall, so long as it is beautiful and works right. You can use pre-cast cement structures that resemble the rock when building the cascading feature. They are compact and not hard to install, as all you need to do is to stack them up on the edge of the water pond. However, you have to buy them. If you can get natural stones, why not exploit the free resources? Rocks: Try to get about thirty rocks; include large, small and flat stones. Flatter rocks have better stability which makes them suitable since this is a dry wall process. Smaller stones can be placed along the edge of the water pond as decorations. A pump: Get a submersible pump from your local hardware store. Tubing: This is used to connect the pump and the waterfall. It should be bought together with the pump. A pond liner: A rigid one is required for this project. Sand: It will be used as adjustable flooring for the pond liner. A carpenter’s level: It will be useful when you try to get your rigid pond liner to stay level in its position. Prior to digging for your outdoor waterfall, get a certified electrician to install a Ground Fault Circuit Interrupter (GFCI) outlet next to the location of the waterfall. This is if you haven’t installed one yet. 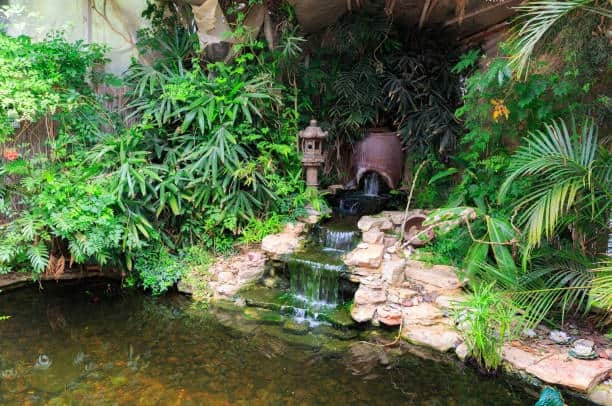 A great location in your compound for the waterfall is next to a patio, as you can sit there and listen to the calming sounds. You also need to make sure that your digging for the waterfall will not interrupt any utility lines underground. Start by pulling any weeds that are growing at the location you’ve chosen for your waterfall, and then continue to level the land. You can now dig the hole into which you will insert the pond liner. There’s a way you can direct your shovel during digging. Turn the pond liner upside-down on the ground, where you’re constructing the pond, and draw a circle. It is better to construct the pond first because you will be laying stones for the waterfall feature such that the front part hangs over the water pond. This involves putting some of the ground rocks very near to the pond. If you were to start with the cascading feature first and then proceed to dig the pond, you may not put the ground rocks well and the hanging waterfall feature will distract your digging. The deepness and diameter of the pond’s hole needs to match the dimensions of your liner. However, if the hole gets too large, you can correct the error by putting sand. Try to shovel sand in the lower end of the hole since sand provides you with a malleable base. Put about 1 inch of sand at the lower end, to allow the rim of the pond liner to stand at about 1 inch above the surface. The elevation is important as it will reduce the problem of ground soil getting into the pond. Place the liner into the dug hole for the pond. Use a carpenter’s level to determine its evenness. If it’s not even enough, remove the liner and move the sand at the bottom of the hole in different directions until the liner is even. After building the pond, it is time to build the cascading structure. Here we will pay attention to the rocks that are the most important, also known as ‘spillway’ rocks. Spillway rocks are those ones that the water will cascade over. They need to be relatively flat and have sharp edges that are somehow square-shaped. Sharp edges that are square-shaped ensure that the water flows well.Rocks that have blunt and curvy edges may make some of the water to trickle backwards beneath the stones, as some of the water will follow the existing curves. The cascading effect will not look that nice and you’ll also lose most of the water, because it won’t land well into the water pond. The idea behind the choice of spillway rocks is to select stones that are bound to channel the water as it falls, in the direct location you want it to follow. The way in which you place the spillway rocks is also very vital. To add to that, you should also try to get some rocks that are a bit cupped.These rocks curl up slightly at their edges, which leaves a depression at the center. The raised edges will suit your cascade design as they will assist in keeping the water flowing in the precise direction. The tubing within the waterfall cascading feature needs to be held in place. You can use containers such as a large plastic flower pot, a Terra cotta pot, a plastic crate, or any other substitutes to hold the tubing as you put the stones around it. The container you use as your housing will be hidden at the middle of the stones, so it won't be visible. Create a tiny trench beneath the rocks where the tubing will pass, to prevent the stones from weighing it down. This is advantageous as the tubing will be free and you can slide it up and down through the pot easily. It also gives you some leeway as you will not know the exact height you want the water to be sprouting at till you're done with laying the stones. Once you're done with laying the first bunch of stones at the front, cover them using a black sheet of plastic. Extend one of the ends of the sheet up to the upper part of the container that is housing the tubing. Tuck the other end over the edge of the pond liner and inside the water. You can disguise this plastic sheet with stones so that it isn't visible in the water pond. Instead of using any sheet of plastic, you can purchase a flexible pond liner. The idea is to have something to catch additional water that the stones alone cannot hold and channel it into the water pond. Furthermore, once you're done with laying the first bunch of stones, and after laying the flexible pond liner/ black sheet of plastic, lay a lengthy flat rock. This rock shouldspan all the other rocks on top of the flexible pond liner/ black sheet of plastic. The long and flat rock should jut out towards the pond, forming an overhang. It will act as a shelf for the spillway rocks. Invert the container that is housing the tubing and gently thread the tubing through the opening at the bottom. Put the inverted container on the ground in the middle of what will eventually be the stone waterfall feature. The depth of your stones will determine how far this should sit behind the pond. The stones facing the pond should about it and even overhang it a bit. In regards to the length of the tubing, have one that is lengthier than what you will require, so that you can trim it later as needed. This makes the work easier. Run your tubing along the right or the left side of your pond and the cascading waterfall. Later on you can conceal it with rocks and maybe some mulch. Normally, when constructing rock wall structures, it is nice to stagger the seams a bit to increase the beauty. As earlier mentioned, once you're done with laying your first bunch of stones at the front, get a lengthy and flat rock that spans all them. Since the rock's role is to create an overhang, it is a major piece in the design of the cascade. Utilizing it as a shelf, put the first spillway stone on top of it, such that the spillway stone overhangs the water pond even more. Commence with laying all the four walls encasing the container until you reach the height you want. Afterwards, lay two lengthy rocks across the top of the walls to span them. If necessary, pull the tubing to acquire added length and carefully sandwich it in-between the 2 lengthy rocks to keep it firm in place. Bend the protruding tubing down in the direction of the pond and put some capstones on top of it. The end of the tubing forms the spout of the waterfall. A capstone is a rock that will semi-hide the tubing and also press it down next to the second spillway stone. Ensure that a huge part of the capstone's weight is put on the stones that have sandwiched the tubing to avoid the flattening of the tubing. The first spillway stone you placed on top of the rock that acts like a shelf, needs to jut out even more than the long rock over the water pond. Elevate that spillway stone at the back to improve the water runoff. You can use small flat rocks to elevate it. Start to place the second spillway stone above the first one, and elevate it too using small flat rocks, to make it steeper. The two spillway rocks should be slanted, and the second one overlaps the first one, creating a continuous passage down over which the water will pour. It is now possible to determine where to place the end part of the tubing that is the spout of the waterfall. All you need to do is to size it up using the top part of the second spillway stone. You can pull the tubing as needed to lengthen or shorten it. You can now fill your pond with water, switch on the pump and examine the flow of your stone waterfall. Obviously, you'll need to make some changes before it works perfectly. The aim is to have the water falling near the center of the pond so that there's minimal water loss as a result of the splashing. It is important to know, a greater height of the waterfall cascading structure results in a better view. However, at the same time it leads to added water loss since the water splashes will have more force. You should consider making the cascading structure proportional to the water pond (the smaller the water pond, the shorter the cascading waterfall). Don't forget to keep safety first!